Set'em up and knock'em down! This is one of the great carnival classics! Looks so easy, but knocking down all three bottle is no easy feat! Can you find the sweet spot and knock'em all down? 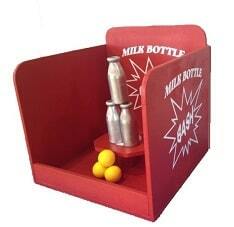 Game includes 3 old-fashion iron milk bottles and 3 softballs. Complete the carnival theme with a Carnival Tent Booth and Red/White Table Cover!